Set in the golden age of Hollywood, this uproarious comedy from the Coen brothers follows a day or so in the life of Eddie Mannix (Josh Brolin), a put-upon ‘fixer’ for studio Capitol Pictures. He’s tasked with keeping big-budget productions on track, wayward stars in line and generally preserving the illusion of Hollywood glamour and propriety at a time when both morals and political affiliations were under the spotlight. Amongst various potential PR calamities, Mannix’s most pressing problem is the abduction of Baird Whitlock, Capitol’s biggest star, from the set of their latest ‘prestige picture’, the biblical epic Hail, Caesar! In this looking-glass la-la land the kidnappers turn out to be a disgruntled group of communist screenwriters who attempt to win over the slow-witted Whitlock (George Clooney at his most gormless, who spends the entire film in ridiculous Roman centurion regalia) to their cause. The setting gives the Coens the perfect excuse to gleefully pastiche various movie genres and tropes – the clumsy homoeroticism of the South Pacific/On The Town inspired ‘No Dames’ musical number is a particular highlight – and to make mischief with made-up movie stars and their industry cohorts, who bear no resemblance to any persons living or dead, honest. 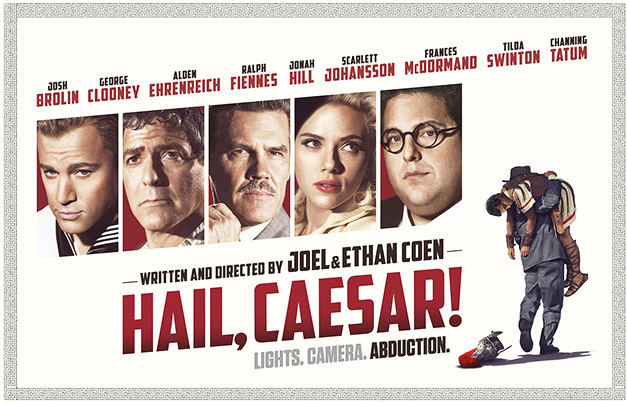 So on one level Hail, Caesar! is an affectionate homage to tinseltown that wants to have its cake and eat it – mocking its excesses and pretensions, the gloss and the schlock, while revelling in it. Consider that there really was a fixer named Mannix that worked for MGM from the 1920s to the 60s, who was in fact a notoriously sinister figure, and it takes on another dimension. This is the story of Eddie Mannix as the lying, manipulative man himself would have fixed it – where the darkest, dirtiest parts are erased to leave behind a sparkling comedy, one in which he gets to be the hero. On whatever level you choose to view it, the Coens certainly know how to put the show into showbusiness.